Celebrate the joys and wonders of Jesus Christ with your children and give them each their very own Personalized Jesus Loves Me T-shirt. A beautiful t-shirt for attending bible study or Sunday service. 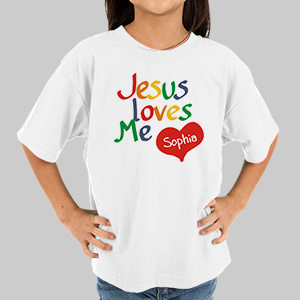 Our Jesus Loves Me Personalized T-shirt is available on our premium white 100% cotton Personalized T-shirt, machine washable in youth sizes XS-L. Includes FREE Personalization! Personalize your Jesus Loves Me Youth T-shirt with any name. I searched online for this particular shirt to replace a previous purchase - needed a larger size. Very happy.